Home GCash Globe How to Verify your GCash Account (KYC) online after registration? Application How-To KYC News Verification GCash Update: Quick List of GCASH HELP List! GCash Update: Quick List of GCASH HELP List! 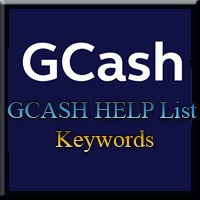 List of Helpful GCash Keywords! To check your GCASH balance, send BAL<space><MPIN> to 2882. Ex: BAL 4321. Please call 2882 should you need further assistance. To send GCASH, send <amount><space><MPIN><space><optional personal message> to 2882+<10 digit mobile no.>. Ex: 750 4321 send to 28829175881234. To change your GCASH MPIN, send CHG<space><current MPIN><space><new MPIN> to 2882. Ex: CHG 1234 4321 OR dial *143# or download the GCASH Mobile App, select Account and then Change PIN. To inquire your last transaction, send TXN<space><MPIN> to 2882. Ex: TXN 4321. To pay bills hassle-free, send BILLPAY<space><amount><space><MPIN><space><biller code><space><account number> to 2882. Ex: BILLPAY 500 1234 GPLAN 12345678. Please call 2882 for list of billers and codes or should you need further assistance. To donate, send DONATE<space><amount><space><MPIN><space><charity code> to 2882. Ex: DONATE 500 1234 REDCROSS. Please call 2882 for list of charities and codes. To suspend your GCASH wallet, send SUS<space><MPIN> to 2882. Ex: SUS 4321. Please note that you can still receive GCASH. To reactivate your GCASH wallet, send ACT<space><MPIN> to 2882. Ex: ACT 4321. GCASH Locked? Read more here! GCash App Preview Balance? Read more here!